Blog What Are The 5 Most Reliable Handguns in The World? 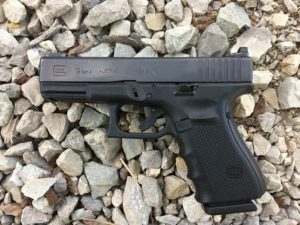 When Glock came out with their model 42 in .380 I quickly bought the first one that I saw at my local sporting goods store (watch video of me shooting it here) and carried it concealed every time that I left my house and was happy enough with it, but as soon as Glock came out with the Model 43 in 9 millimeter, I quickly traded up. If I remember correctly, I traded the used Glock .380 and gave $100 “to boot” before taking home my new Glock model 43. The Glock Model 43 is my number one choice for a semi-automatic concealed carry gun. It’s nearly identical in size to a snub nose revolver but thinner holds six rounds of 9mm in the magazine plus a round in the chamber and is also easier to shoot and reload under stress than a snubnose revolver. The Glock 43 is the ideal size and weight for consistent everyday concealed carry where carrying a full-sized handgun would be impractical for most. Remember… the number one rule of a gunfight is to have a gun and this is a gun that you can have on you at all times. In the past when asked what my top choice for a .22 caliber handgun is I’d have said a Ruger Mark III standard model with a 6 inch barrel, and while this is still a great choice, however, after owning a Browning Buckmark for over six years, it has now earned my top rating for a .22 caliber handgun. I’ve used mine to put a good number of squirrels, rabbits, groundhogs and even a few pheasants in the pot. And I carried it nearly every day when I ran a trap-line and used it to dispatch of trapped raccoons, fox, and coyote. In my opinion, the Browning Buckmark is the best .22 semi-auto handgun available. As with all .22’s it’s best to buy several brands and weights of ammo and test it in your handgun to see what works the best because .22 caliber pistols can be picky when it comes to certain brands of ammo. With that being said, I’ve shot at least ten different types, weights and brands of .22 ammo in the Browning Buckmark and its all worked without any stoppages besides a few “dud rounds” that were cheap ammo related, however my chosen .22 ammo (for both my handguns and rifles) is the CCI Mini Mag. The CCI Mini Mag is an excellent round for hunting small game and to use on a trap line, however, because the hollow points are so destructive on small game and destroy a lot of the usable meat I use the solid round nose version when hunting small game and while running a trap line. The Smith and Wesson MP .22 is another .22 caliber handgun that gets my top rating and is a close second to the Browning Buckmark. One major plus is that it’s lighter in weight than the Buckmark making it easier and less tiring to carry on a trap line (or anywhere else) where you can be gone all day checking your traps. It’s also easier to find quality holsters because holsters for its big brother the Smith and Wesson MP 9 will work in most cases and if you have a Smith and Wesson MP 9 Pro series as recommended below then most holsters are interchangeable between the two and using the .22 version makes cheap (cheaper) practice when running drills or just plinking at empty soda cans. I have to admit that it would be a very difficult choice if I were forced to choose between the Glock 19 and the Smith and Wesson MP9 Pro series. While I love the Glock 19, the Smith and Wesson fits my hands better than any other handgun that I’ve held and shot. The grip design is wonderful and is a big help in control and quick and accurate follow-up shots. I’ve owned the Smith and Wesson MP9 Pro series for over a year and have shot lots of cheap ammo and even some reloads and every time that I’ve pulled the trigger it’s fired with no stoppages of any kind. And I can shoot it more accurately than any other center-fire handgun that I’ve ever owned… including the Glock 19. 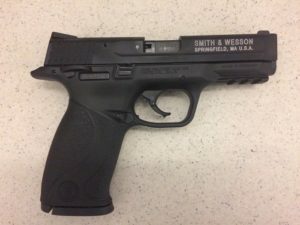 If you’re a shooter who has small hands (or big hands) and are looking for a full-sized handgun then the Smith and Wesson MP9 Pro series definitely worth taking a hard look at. You won’t be disappointed. A few days spent doing research will help you avoid making mistakes. Know what guns to avoid and shotgun, handgun, rifle action types before you shopping. Learn about the different calibers and types of cartridges that are available. Get a copy of “The Shooter’s Bible“, “Boston’s Gun Bible” and Guns 101. Avoid most of the “this is the best survival gun” type stuff posted on forums and the web, most of the information is dated, wrong and of little use. Never walk into a gun shop without an idea of what you want, if you don’t have any idea what you want, you need to do more research until you do. Some salespeople can be pushy and you don’t want to be pushed into buying something you don’t want or need because some overzealous sales clerk needed a commission from your purchase. Before you can be sure of what you want, you have to know what you want it for. If your intention is concealed carry then your needs would be different than if you wanted a firearm for hunting or foraging. For example one of the best and most devastating close range weapons is the 12 gauge shotgun when properly loaded, but you would be at a distinct disadvantage if hunting on flat open terrain or needed concealment. There is no one do everything firearm, so stop looking. If you want to cover all the bases, you’ll need a minimum of three different guns. A handgun, shotgun and centerfire rifle, and even with that three gun battery there are some gaping holes about what you can do. Of course, if you know you could not shoot someone in self-defense then guns for foraging may be all you will need. With firearms, price doesn’t always mean quality. Granted, some of the best firearms available are costly, but that doesn’t mean that they are the only quality choices available. Whatever firearm you buy, it should fit your body and grip. A gun that fits your body will be easier for you to use and more accurate than if you have to force your body to conform to the size and shape of the weapon. The gun should be an extension of your body and it should feel natural when held in a shooting position. This can not be determined by anyone but you-you have to hold the firearm, point it and aim it to determine how well it fits your body. Guns and Ammo posted a great article that can be read here titled “The Right Fit” that everyone should read. The article is about handguns but many of the principles can be applied to long guns as well. Get training. Most areas offer hunter safety courses that are free to anyone wanting to take part. If you live in a state that issues handgun carry permits, sign up to take the required classes, most are great for learning basic care and safety rules. The NRA offers a number of low-cost training opportunities that you should look into. No doubt a few women know just as much about guns as I do. But on the one, the other hand most women (and a lot of men) tend to become rather unsure or even frightened when coming into contact with anything even resembling a firearm, and when faced with the prospect of choosing a handgun for self-defense they become lost within the maze of choices available. For those with no experience with firearms, training becomes a necessity. Spending a week at Front Sight would be great but realistically out of reach for most. Most areas offer hunter safety courses that are free to anyone wanting to participate. If you live in a state that issues handgun carry permits, sign up to take the required classes, they are great for learning basic care and safety procedures. If your husband, boyfriend, father, mother or someone else that you know has proficiency in this area this can be an excellent source of information, just be certain that the one doing the teaching knows more than the one doing the learning. You would be surprised at the number of people claiming to be an expert in this area that knows little or nothing of what they are talking about. There are two books that I recommend for those new to handguns and shooting. “The Concealed Handgun Manual: How to Choose, Carry, and Shoot a Gun in Self Defense” and “Tactical Pistol Shooting“. Both books get my highest recommendation and lay a good foundation for beginning shooters. How does the gun feel in your hand? Are you able to obtain a proper grip? Can you reach the trigger without twisting your hand and wrist to compensate for reach? Your index finger should extend at least ½ inch past the trigger when holding a shooting stance with the finger held straight along the side of the weapon. In this case, size does matter. The debate over Revolver vs Semi-Auto has been going on for years, for the most part, this has been a complete waste of time and effort. Both are effective and safe in competent hands, the important thing is to become proficient with whichever you choose. As the saying goes; bring enough gun. If the intended use is self-defense choose at least a .38 special for revolvers and a .380 for semi-autos. Some of you will be tempted to get a .22lr or .25 auto, don’t do it. The .22lr is great for training, plinking and small game hunting but is not the best choice for defense. The .25 auto is worthless for just about everything. Yes; both can and will kill, just don’t bet your life on either to stop an attacker before he can kill you. If the primary intention is concealed carry, size and weight should be taken into consideration. Personally, I prefer a two-inch .38 special “snubbie” revolver with a concealed hammer for concealed carry. In the home where space and weight are of no consideration, I prefer a four or six-inch barrel for revolvers or a full-size semi-auto pistol. Just because you are a woman doesn’t mean you need a man for protection, with training and the proper tools you can defend yourself. Prepare for the worst and hope for the best. Well there you have it – my top five handguns for preppers and tips for buying your first handgun now over to you – what are YOUR top five handguns? Why? The mere fact that you fail to include ANY revolvers in the most reliable is a red flag for me! I don’t doubt your expertise, I just question your choices. Granted, autos are for the most part extremely reliable. I carried one for years, still have two or three that I trust implicitly, however!!! My 1911 was professionally worked, and is about as reliable as they come, but I have still had stoppages with it, with everything except hardball, and it will usually digest anything, including 230g lead reloads with the slug loaded backwards! My Sig P226/40 is first rate, but our department taught failure drills several times a year. We were NEVER taught failure drills when we carried revolvers, and I can’t recall a malfunction with a properly cared for Mod 58 or Mod 19. I bought a PT 111 after reading about it and its reliability when it was tossed into a torture test as a low cost alternative and beat all the high priced competitors. Mine lost it’s rear sight after less than 300 rounds and it took forever to get a replacement! Good thing I’m a very proficient combat shooter of the “from the hip” era! Auto’s are all the current rage in the pistol world, and I’m sure the winds will continue to blow to and from……….but, I was raised on revolvers, I carried and depended on them for years, and I saw autos encroaching on the scene when the “need” for more firepower replaced the requirement for accuracy! I use the great LAPD bank robbery shootout as an example. Let quantity replace quality and accuracy………. And for 22’s? I rely on my old High Standard Double 9 with a 4″ barrel or my S&W 618……..both go bang with each and every pull of the trigger. Good article, I just disagree with your choices, or should I say omissions! If you look at the top photo it reads semi-autos… Revolvers could (and probably should) be a whole new article. Thanks you for your comment. Revolvers are not the most reliable, in fact they are among the least overall reliable firearms available. There is a reason outside of ability to quickly reload which VERY few shooters can do “reliably” with a revolver, that revolvers are not used by any but the most stubborn backwards agencies in the world. Here is the thing, your revolver cannot stand up to the same pressures and or approaches that my handgun will. This said, I love my Ruger SP101 , Colt Trooper and S&W M&P bodyguard and the model 10 – I cannot and never would claim they are most reliable, I have had to adjust timing several times on ALL of them, and have never made it through a 3 day class (I have taught, run or taken several dozen in the past decade alone) with one, nor have I ever seen a revolver make it trouble free through one. Reliability is a real thing, revolvers are not the most reliable, for that matter neither are stock 1911s. So yep. Well said. I carry the shield or g19 for defensive purposes exclusively these days. Good advice… however, I’ve had mine for nearly 10 years and shot probably 2,000 rounds through it and no firing pin issues. I agree with your assessment. I believe that a woman or any 1st timt shooter should also go to a gun range and rent several calibers. Find the most powerful Cal. that they can shoot well & fits their hands. Also I don’t believe in off body Cary (purse)at All!!! It’s a good for a bad guy / girl to get your gun. One of the best articles I read ! Practice, practice, practice, no matter what you carry. And take a good firearms pistol course for good training Technics! I’ve gone out to ranges over the years and shot all my guns until they stopped or I ran out of ammo. It is the only way to get to know your jam points. When they stop they usually need to be cleaned. But at least you know. early 1980’s SIG P 220’s were the forerunners in the Army /Delta/ DOD tests. Baretta came in second, was cheaper, and got the contract, but tier 1 operators were able to keep the SIG P225 & P226. All after extensive testing. Now, after all the recent testing, SIG wins the competition & bid, and thus the P 320 is the new carry weapon. I don’t understand your love affair with Glock, but a lot of people seem to like them, to each his own. I have SIGS, as does my family. To my knowledge, none have had any issues with our SIG pistols (P220 & P938) or rifles (556, 516 & my favorite .716). I’ve owned and carried Colt revolvers, S&W revolvers, Remington sa, Colt 1911, and many others. They were OK, but I love my SIGS. I’m not a troll, I’m expressing my opinion. Yes, I’ve owned Sigs and they are a good handgun. Nanook, the new SigP320 won the contract because it was $3 less (at the time) than the Glock in the running. While two models of Sig have solid performance records, many sig models including the sigP320 have suffered from major flaws/failures. There is a reason the DOD chooses, it has never been solely reliability. I would suggest looking at LE department choices/ they are somewhat more likely to choose for reliability and ease of use. Hence the Glock 17-19 and Smith and Wesson M&P series.